Here’s a key: your happiness is not somebody else’s responsibility. You are responsible for your own happiness. Too often we’re counting on other people to keep us fixed. Someone else to keep us cheered up, encouraged, feeling good about ourselves. You’re putting too much pressure on the people in your life. Let them off the hook. Nobody can keep you fixed except our Heavenly Father. Don’t go to people trying to get what only God can give. Thank You, Father, for giving me Your Spirit to help me when I pray. Thank You for hearing my prayers and for loving me. Because I know that when we can’t put our prayers into words, God hears through our hearts. 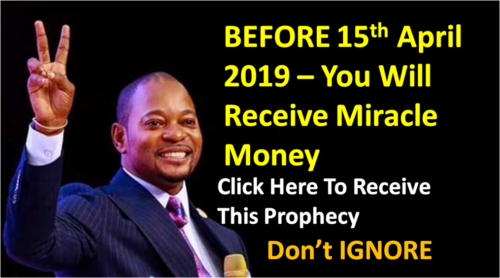 I receive it my miracle money before April 15th 2019 IN JESUS NAME AMEN!! Amen and amen.I receive in Jesus’name. In the name of Jesus i am one the 3000, one way or the other Holly Spirit do not live me or forget this me this time i pray. Under the anointing of my father let it be, i pray. I receive it in Jesus name. Amen! I receive my miracle money in Jesus name Amen Amen Amen! Waiting to receive God miracles! LORD JESUS, BLESS ME SO THAT I CAN BE A BLESSING TO OTHERS. In Jesus Christ, waiting for your miracle money to be received. I am in need of vehicle right now to be able to move around. AMEN. l receive the money miracle in the name of JESUS name amen. THANKS man of GOD. I receive miracle money before 15th April.Thank you Jesus.Amen. I pray for everyone. May you receive your miracle also.May God bless you and yours Alph Lukau. Thank you Lord for your financial blessings. I receive it in Jesus name. Amen. I also wish that everyone one this website receive the blessings also.